Today we have something special, something quite unlike anything I’ve ever seen. And perhaps, simply because it is quite unlike anything we’ve ever seen this gin should be something special and rather exceptional. At a time when aging gin is rapidly catching on, with several distilleries experimenting with their first batches often time aging gin for up to 6 months— some are even up to two years— but usually less. It seems astonishing find to come across a gin like Myrtle Gin which is aged nearly 20 times longer than what would normally be considered “old age” for an aged gin. 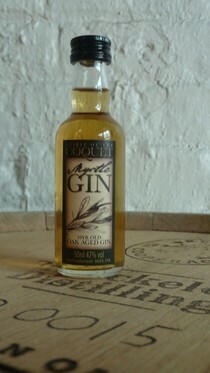 Furthermore Spirit of the Coquet’s Myrtle Gin is also infused with Bog Myrtle from Northumberland. On the nose, there’s a lot of earthy, peaty, oakey flavor. It is clear that this is not your normal aged gin. I keep going back to the parallel of the “peat monster” in the world of Scotch. Its not quite appropriate, its definitely not peat here. But to express the overwhelming character of the oak, its hard to find another way of putting it. Is it an “Oak Monster?” Yes. Though the oak never quite goes away, it does ebb a bit, which reveals a hint of something juniper-like in Myrtle Gin. Its not distinctively gin like though at any point. The finish is oakey with only a faint intimation of the juniper on the palette. The alcohol burn is strong with this one. Warm on the palette, seemingly thin in the way the flavor moves to the back of the palette so quickly and lasts particularly long in the finish, fading slowly and leaving only an oak light note in the back of the mouth. It is oft repeated that you should hold a fine Scotch on your tongue for one second for every year that it has been aged. Let’s see how it holds up. Starts hot and oakey, becomes warm and smokey in the middle quickly burning up a relatively intense heat of alcohol (and only 47%!) and rolls into that long finish that I previously talked about, but leaving just that smokey, oakey, long tail with a bitter dustiness. I have a hard time thinking beyond the simple “drink this on the rocks,” or “drink this neat.” Its not really built for mixing in a cocktail, and as aged gins are already quite limited in utility, this 10 year aged gin is probably not equipped for anything outside of that narrow scope. I think the heat and burn is unrefined, and it reminds me of a mediocre sort of whiskey. The complexity and depth just isn’t there. Sadly, the tasting largely causes me to think that this is a novelty worth seeking out for its age, and for that single fact alone. Myrtle Gin is curiosity and a remarkable rarity. There’s nothing else out there quite like it. But It’s remarkable un”gin-like.” Scotch drinkers might enjoy the “juniper-like” edge, but gin drinkers might be put off by the striking similarity to other seriously aged liquors.